Steve Crisp - "Taking that bow was like the coolest thing ever...I mean that was spectacular." Dale Jr. - "That's one of our best cars so I was thinking I was going to smash it into the fence, so I saved it off the wall and the fans in turn three and four were screaming like crazy....Some of them were screaming that I sucked of course....(Laughing)....But some of them I think were my fans." Josh Snider - "Why is that?" Dale Jr. - "Some of them don't like me and some did but I believe I had a few fans over there, so I bowed." Josh Snider - "That pisses me off." Dale Jr. - "So I bowed for them...They got a good show...Couple three donuts." Josh Snider - "All you're out there trying to do is entertain them." Dale Jr. - "I know and they got a little entertainment...I was just trying to make SportsCenter...That's all that was about." Tune in to tomorrow tonight at 7:30 PM to hear "Dale Earnhardt Jr.'s Unrestricted," which follows Jimmie Johnson's "Not What You Expected" at 7PM on XM Sports Nation (Ch. 144). Immune globulin that is. If she ate anything at the Sports Illustrated party catered by Wolfgang Puck, she wants a shot of it. Los Angeles County health officials say that a prep cook with Wolfgang Puck Catering in Hollywood has been diagnosed with acute hepatitis A, and anyone who attended the recent SI party may have been exposed to the virus. Is that where Justin learned these moves, too? And just how old are those girls givin' the 12 year old a lap dance anyway? 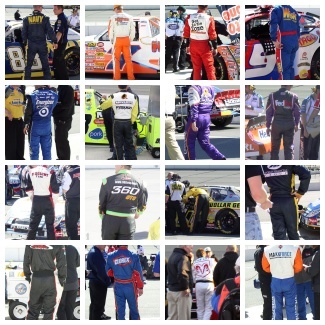 First one to identify all of the NASCAR booties above correctly in the comments gets an XM Satellite Radio hat. Need more incentive? No FAQs 'til someone gets it right. Need a better look at the pics? Tara was the fourth reader to submit her guesses, the first one to identify all of the tushies correctly and confidently and with the proper spelling. Oh... I didn't mention spelling counts? I thought that was a given. Maybe Tara will send us a picture of herself sporting her new XM hat when she receives it. She doesn't know it yet, but she's going to get another lil' surprise in her package, too. Maybe she'll tell you about it. 7:00PM ET - Guests on "Jimmie Johnson's 'Not What You Expected'" tonight will be North Carolina Governor Michael Easley and Virginia Tech men's head basketball coach Seth Greenberg. 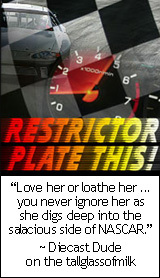 7:30PM ET - Tonight on "Dale Jr. Unrestricted" Junior interviews Daytona 500 winner and California native Kevin Harvick. I'm not doing this every week, just wanted to make sure you guys are paying attention to the tallglassofmilk's NASCAR calendar in the sidebar. There's stuff there you want to know. TGOM will be at the speedway the majority of the weekend, so FAQs are questionable, pics guaranteed. #15 Clint Bowyer: That was an insane-looking crash he had on the final lap. They should use footage of it in a commercial that says, "This is what happens when you do not drink responsibly."